wait .. is there also nearly 2TB of storage space in that array!!? OMG! Scarry, in more ways then one. I'd like to sit back and watch your system boot. being the AAKS drives, I am not too worried about failure. To be on the safe side though, I do have the array backed up just in case the power goes out while my desktop is on. I'll be buying a battery back up this week, any suggestions? Thats pretty speedy. And possibly unreliable. But you got it covered it seems with a nightly backup. Hey Wolfjet, post up your speeds to compare to 4D7's since you are running SSDs. 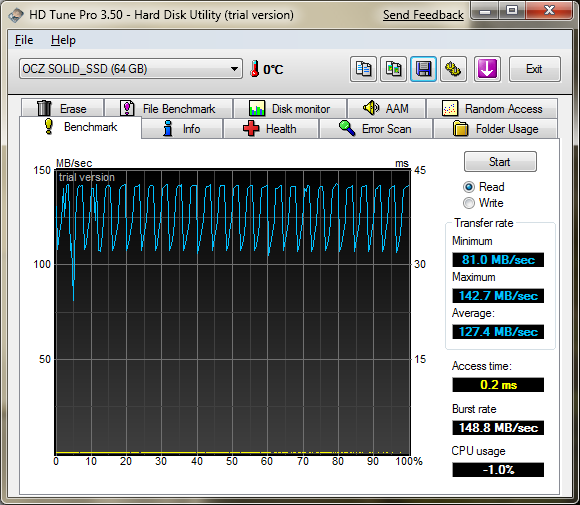 here is the latest SSD benchmark I could find using the same version of HD Tune. of course, that is not a raid config. Its nearly 100% slower than my current config, but destroys my arrays response time ha. 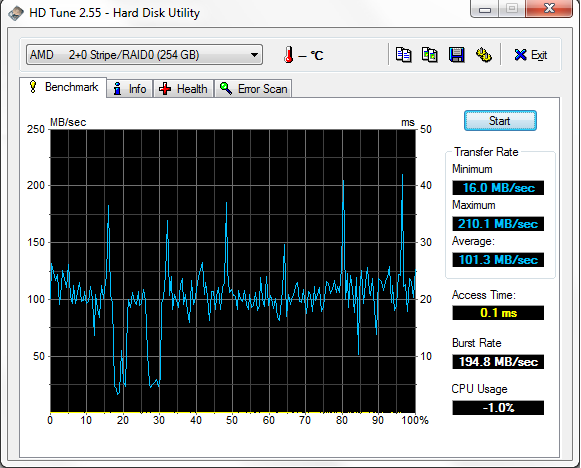 I'd imaging a single Vertex SSD could compete if not out bench my array, let alone two of them in raid. My point is, look how fun it is two make old tech out perform the new tech for half the cost. Sure, the odds of data being lost is greater, but I could care less about my games being corrupted and I only paid $150 vs $350 for comparable performance with 20x the storage. Yes. Your drives are much much faster than 1 SSD and cheaper. What does RAID mean? Redundant Array of Inexpensive Disks. That my friend is what you have done. Good job! Ill get my HD speeds and post it. You will probably ROFL. Oh! What program are you using to backup your drives nightly? My single WD 500 GB AAKS drive. Its not even moving in comparison. I hooked up two 160GB drives and Syba 2 port SATA RAID card. Configured in RAID 0. 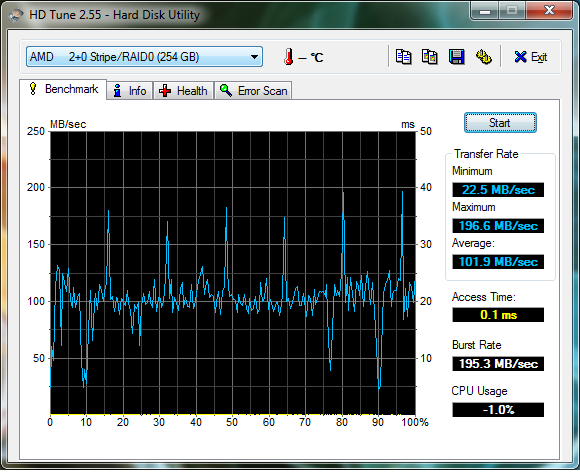 This is pretty good for a couple of cheap drives. 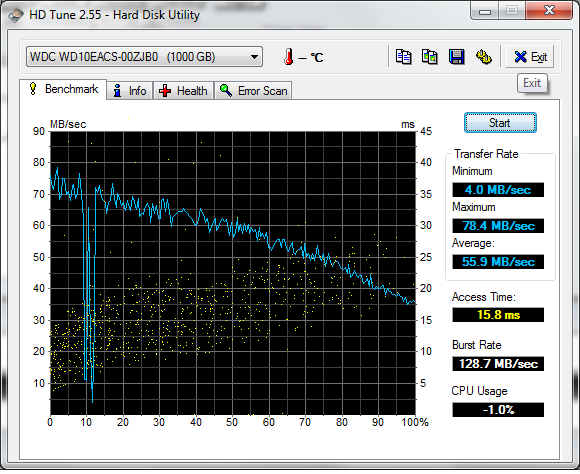 There's no yellow dots on the SSDs. Just a line at the bottom. Dang that's fast! Yeah, the access times average 0.1 ms. That is fast.